Let’s all take a moment and take a bow - in homage to the popular (if overused) marketing maxim - “go where your customers are”. With an estimated 2.1bn social network users worldwide, marketers are flocking to where their customers live, with spend on social advertising growing by 50% year-on-year during the final quarter of 2015 alone, according to Kenshoo. However, paid advertising is a rough terrain. With careful planning and tracking, it can be a smooth and lucrative path to leads and sales. But, it can also be a rocky road to rule. In the age of relevance, approaching customers with a one-size-fits-all social strategy is just plain foolish. So how do we ensure our messages are sent to the right people at the right time? In this blog post we’ll explore different customer segements you can approach through custom audiences, to ensure your ads are consumed by the relevant audience and you get more bang for your marketing buck. So, what are custom audiences exactly? Many of you will be very familiar with custom audiences, but for those less acquainted they enable advertisers to target their ads to a specific people with whom they have already established a relationship (i.e. collected their email address or phone number). Simply put, you can build custom audiences based on email address lists of people who are already part of your audience (your subscribers, current customers, past purchasers, high value customers, loyalty programme members, lapsing customers, etc). Akin to Facebook Custom Audiences, other tools such as Google Customer Match and Twitter Audience Manager do more or less the same thing (and for the purpose of clarity, we refer to all of these when discussing custom audiences in this post). You can manually compile lists of up to 20 (in Facebook’s case) which is a tiresome, time-consuming process, or use technology (like the Ometria platform) to automate the process (giving you some time to finish that Rubik's Cube that’s been collecting dust). So, you’ve been lucky enough to secure a new, shiny email address, but that prospect is stubbornly quiet and yet to make a purchase (boo hiss boo). What can be done to lure their cursor onto the buy button and transform them from a prospect into an active, loyal butterfly? Well, we’ll tell you. Segment yet-to-purchase subscribers into a list and target them through custom audiences to educate them about your brand USPs. Take Eve, who used custom audiences to convince new subscribers to shop with this educational ad: highlighting their free delivery, 100 night trial and 12-month payment plan in bid to drive sales. It’s wise to avoid dishing out discounted incentives at this initial stage, to avoid needlessly chipping away at your bottom line during a period where new prospects are (more) likely to convert. However, a future list could be made up of new subscribers who haven’t purchased after 4 weeks, let's say, with a tempting discount to clinch that almighty first sale. This is a good example of how retailers can tweak messaging to suit different audience behaviour, custom audiences being the perfect vessel. A message delivered to a new subscriber who is yet to purchase but is displaying activity on-site should be slightly different than a message sent to a new subscriber who is AWOL. This group can be wooed with all of the tactics in the previous point, but with one key difference: you can use their data footprint (such as the items they've browsed) to make these ads more relevant to their interests. For example, retailers can use browsing behavior, possibly coupled with discounted incentives (“we saw you looking at this, here’s 10% off”) to secure conversions. 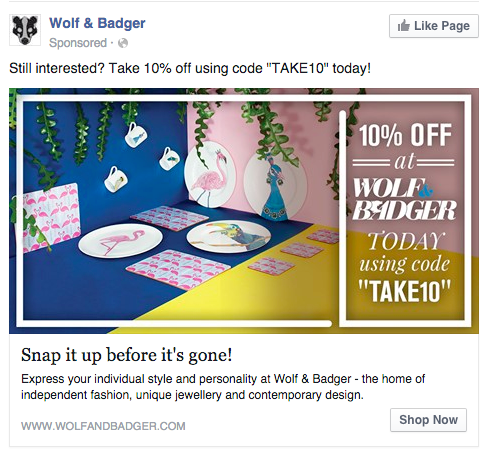 Check out this Wolf & Badger example, recognising my activity on-site (yet my inactivity re: first sale) luring me towards a conversion with a nifty money-off incentive. So your hero customers are your trusty steads of ecommerce: Mr Pareto (posthumously) stands by his 80/20 rule, so you should pay close attention to this segment and treat them well. Using custom audiences you can tweak your messaging to speak to your loyal fans in a familiar tone, that recognises your special relationship and rewards them in different ways than messages directed at the unknown masses. These advocates or brand evangelists (if you will) are the people who share your content with their friends the most and really help spread the word about your company. Once you identify who your ambassadors are, it could be a great idea to create targeted ad campaigns to make sure that these people are seeing all your best content. Reach out to let them know that you value their business and extend an exclusive offer like free-shipping on any purchase, free overnight shipping, free gift wrapping or early access to sales. As well as utilising custom audiences, think about building lookalike audiences (on Facebook, for example) to find unknown prospects who look like your established VIP customers in a bid to flesh out your loyally lucrative segment. Last year, Cyber Monday became the biggest US online shopping day ever with close to 2.3 billion US dollars in online spending (spending via mobile devices reached $12.5 billion) with similar trends recorded across the globe. Find the customers who purchased from you in the week preceding big seasonal events last year, for example, and be sure that you’re trending in their social feed when they wake up in the middle of the night in a cold sweat, ready to panic buy. Similarly, if you can segment your customers based on annual patterns (birthdays, Christmas, anniversaries, etc) you can define gift shoppers and target ads at them in the weeks leading to important purchase decision moments. Paying close attention to the lifetime value of your customers, by employing formulas such as order gap analysis, glean which of your customers are falling or have fallen off the wagon and target them with win-back campaigns. Segmenting your lapsed customers is key, as customers can fall silent for any number of reasons, so it's best to identify customers you have a particular interest in re-activating (such as once-loyal, big spenders) and target lapsing heroes (for example) on social via custom audiences. There are technologies (like our Ometria platform, for instance) that do all the analysis necessary for identifying and segmenting customers that are at risk of lapsing. Put together a list and target churning customers with product categories they used to purchase the most, for example, or simply send messages looking for answers (“Have you forgotten about us? Come back and get £10 off”). So, you can see prospects browsing and popping things in their baskets...and then fleeing without spending a penny (the shame). You can use custom audiences to upload lists of abandoners and target them with their discarded items (similarly, you can also use tools such as Facebook Exchange for retargeting). 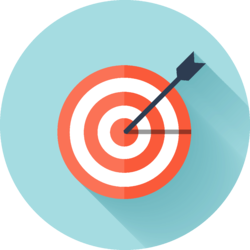 With custom audiences however, you can take retargeting further, by segmenting your audience into categories, such as abandoning hero customers and serve them ads recognising their on-site activity and previous custom, for example. Use the average time to repurchase of a product (not suitable for things likely to be a one-off purchase), and create ads that will serve as a reminder to repurchase, when it’s likely to be running out. Again, retailers can pay close attention to order gap analysis or repeat speed rates to align their replenishment campaigns with the appropriate segment, at the right time. We all know how superior email marketing is in terms of reach and measurable engagement, so why not extend your successful email strategy with social? You can push its effectiveness to the next level with complementary social targeting (via custom audiences, of course). After you send out an email campaign, export a list of non-opener email addresses from your email service provider and retarget customers through custom audience tools using similar content (especially if the newsletter in question contains key messages about promotions and offers). So, let's get hypothetical. Imagine you're selling a gorgeous pair of caramel chinos that go perfectly with a white pair of leather stilettos (I said we were getting hypothetical here). 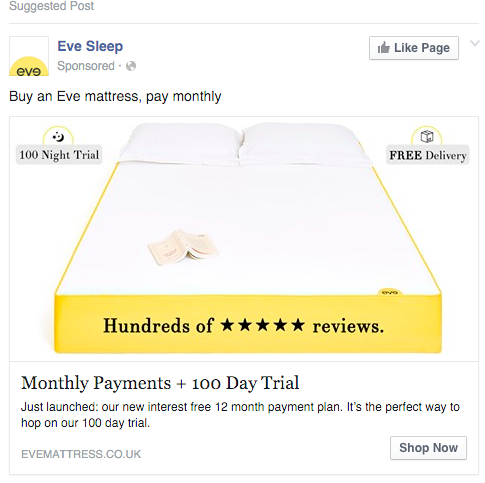 You can use item-first bought behaviour to target shoppers with popular follow-up products. You can decide which follow-up item to target customers based on popular second-purchase items (you'll have to dive into your product data for this), or simply think about what products typically accompany particular products. For instance, an ink cartridge would probably be a good follow-up item for a printer. Picture this: you've got a group of products selling like hotcakes, you've got loads more stock left but you've exhausted all other marketing channels. All you need is to get people to see how great this stuff is and they'll buy. No doubt. Well cooey custom audiences. Segment your audience into frequent shoppers and target them with your hot products, in a bid to get eyeballs onto your best-selling gems. "To affinity and beyond", goes that famous saying, right? (sorry Buzz fans). A great way to serve relevant ads to the right people is to segment your list into groups that share particular product affinities. Product affinity segmentation divides customers into groups based on purchased products, loosely finding a natural liking between customers and the different products they buy. Let's say, for instance, that you're a fashion retailer launching a new range of dresses for those attending weddings. You could create a segment of customers who have viewed your 'dresses for weddings' category within the last month, and retarget them on Facebook with ads specifically showcasing the new range. Based on a particular product affinity sets, marketers can use custom audiences to reach customers with specific content that they're more likely to engage with, a friendly iceberg in this sea of social distractions. Your customer data holds a wealth of insight on who your customers are and how they shop. Take your segmentation strategy to the next level by looking beyond demographic data and into metrics and shopping patterns. It will take some extra work, but get it right and you’ll have a message that stands out. If relevance is king, then, custom audiences is his queen.